For hours I wracked my brain to figure out what I was going to write today and still came up with very little, so please excuse this meandering and somewhat aimless progress update. Well, for the first time in a while, I have actually been writing pretty consistently. I wish I could tell you what has suddenly caused this change in productivity. Part of it I think it is shaking off the transition period from the end of the semester, but I think a lot of it is taking the pressure off myself. For a while, I was telling myself, “You will write 1,000 words or you are a terrible writer!” Well, that doesn’t accomplish anything and only makes you feel bad about yourself when you don’t reach that goal. Then, I tried not editing anything while writing. I ended up getting frustrated because there were scenes I was itching to fix and it made it very hard to go forward. Now, I have been sticking to what I like to call the croissant dough method. It can also be called two steps forward and one step back. When making dough for croissants, you need to continually fold it and layer it with butter. By building up the dough and breaking it down, you make a richer product. What I do is reread what I wrote during my last writing session and tinker with it. I tend to build-up scenes when I do this sort of editing because I have a tendency to write before bed, which leads to missing words and skimmed scenes that need to be beefed up later. By doing this, I also become reacquainted with my work, which makes it much easier to move forward. In terms of word count, I’ve told myself that I need to write daily, which I’ve done all week thus far. My goal is to write between 500 and 1,000 words each day, and for the majority of the week with the exception of two days, I have been able to do that. This actually surprised me because in the past I have not kept up with it when I set word count goals for myself. I will admit that it felt like it took forever to get to 10,000 words, but now that I have passed that milestone, the words seem to flow easier. Right now, my biggest issue is trying to weave in the many threads that will make up the plot for the rest of the book, and because I’m not that far into the book, I feel like I am sitting in the middle of a yarn basket. Well, hopefully as I reach the middle of the book, these threads will weave and knot and eventually form a story. For now, I keep telling myself that I’m not even a quarter of the way into the narrative and can’t rush things. The croissant dough is a great metaphor! Good luck – I hope this method keeps working for you! I do the re-reading thing too – I need to get back into the flow of the story before I can start writing. Which is why word sprints tend to be not very productive for me – I spend half the time re-reading. Can I have coffee with that croissant? What else goes with a croissant? Now I could go for one. 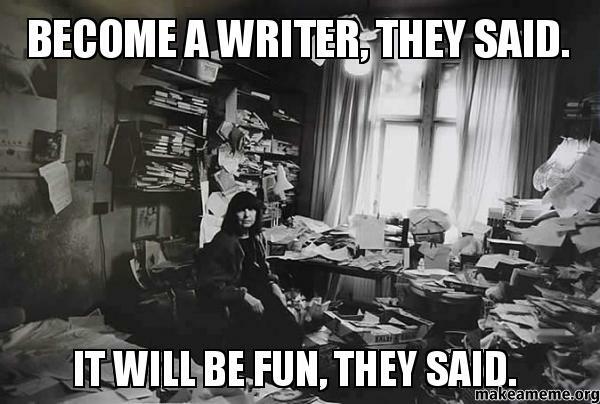 I usually do a writing sprint after I outline and reread. I don’t know if it counts as a sprint, but yeah, no spontaneous sprinting.